Filipinos have a knack for comedy. We joke about our struggles and laugh about difficult situations as a way to get by them. But when things become too absurd, where do we draw the line between what is still funny and what is no longer a laughing matter? “Charot,” a Filipino colloquial term that means “just kidding,” underlines a pun. It is used to downplay an otherwise scathing statement to mere jest. A safe word, it turns its argument on its head, watering it down to avoid the ire of the message’s receiver. PETA Theater Actors invite you to watch CHAROT! As things become more and more ridiculous in our society, Filipinos do not choose to remain silent. Unfortunately, many opt for something worse: laughter. We laugh in the sidelines as someone drives the country to debt, discord, and chaos. We laugh to escape and to convince ourselves that this joke, too, shall pass. But what if you are brought to the front and center? What if you have the power to make the laughter stop? 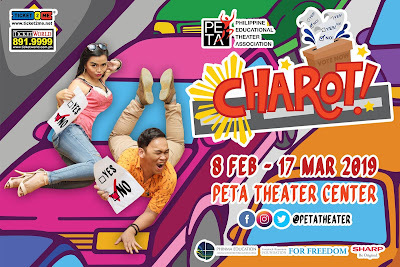 Set in 2020 Philippines, PETA’s 51st Theater Season ender is a comedy play with songs aptly entitled Charot! It engages audiences by taking into account an important choice they will make during the play, that will decide how our story unravels. In a place where a leader showers kisses and calls first dibs on women, where God is painted stupid, and where “knock knock, who’s there” is answered by a gunshot to the head – everything is a joke. But PETA’s Charot! is all imaginary… right? And it has a hilarious punchline: Under a new charter, the Philippines will be united under the banner of federalism… Charot! PETA’s Charot! provides a platform for discussion regarding the fine print of the proposed Charter Change: the amendments on the freedoms of expression, ownership, and most especially, federalism. What is it and what will it borne in the given context of Filipinos? 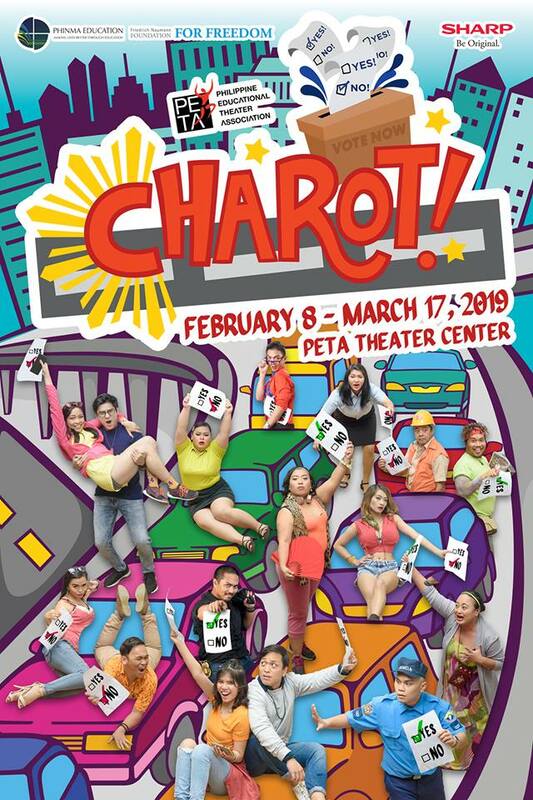 As a response to the call for unity by breaking the walls between generations and social classes, PETA’s Charot! will constantly break the fourth wall to engage audiences in a dialogue, in an aim to rid of what divides us beyond the stage, such political biases, poverty, conflicting worldviews, and more. PETA’s 51st Theater Season ender introduces a dynamic cast of newcomers and veterans: Jack Yabut as Papsy, Teetin Villanueva and Gardo Vicente as Millennial Girl, Bene Manaois and ABS-CBN Star Magic’s CJ Navato as Millennial Boy, Meann Espinosa as Tita Mary Grace, Sister Joy, and Karen De Villa, Kitsi Pagaspas as Nanay, Jason Barcial and Gie Onida as Boss, Gio Gahol and Lemuel Silvestre as Beki Grab Driver, Gold Villar-Lim and Jimma Nariz as Grethel Tuba, Icee Po and Rhapsody Garza as Mall Saleslady, and Norbs Portales as Street Vendor. Similarly, the artistic team includes up and coming talents as well as seasoned ones: J-mee Katanyag and Michelle Ngu (playwrights), Maribel Legarda (director), Vince Lim (musical director), Jeff Hernandez (additional songs), Ian Segarra (choreographer), Boni Juan (set designer), Julio Garcia (set supervisor), Gio Gahol (costume stylist), Denise Nayve (associate costume stylist), Gerhard Daco (technical director), Jonjon Villareal (lights designer), and Ellen Ramos (video and animation). PETA’s Charot! will make audiences laugh. It will inform them of what the joke’s all about, and then will make them think: Is it really funny? Is this still imaginary? Who’s really laughing now? This is our rehearsal for democracy, or the lack thereof… Charot! PETA’s Charot! 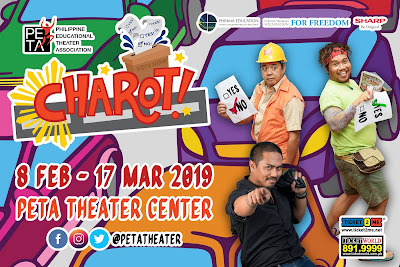 runs from February 8 to March 17, 2019 at The PETA Theater Center, #5 Eymard Drive, Brgy. Kristong Hari, New Manila, Quezon City, with shows on Fridays (3:00pm), Saturdays and Sundays (3:00pm & 8:00pm). For inquiries and ticket reservations, contact PETA Marketing and Public Relations Office at Tel. No. 0927-603-5913, TicketWorld at 891-9999, www.ticketworld.com.ph, or Ticket2Me at 721-0431 to 33 loc. 8109, www.ticket2me.net.